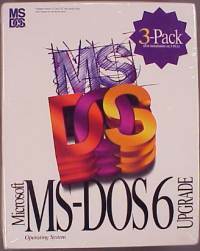 This document lists brief descriptions of Microsoft MS-DOS® operating systems for the PC, along with a brief list of features and notes. While you may find older versions of software in many places, links to the old/used programming tools sales pages of EMS Professional Software, this page's sponsor, are provided for your convenience. Version information on other Microsoft Products. Version information for software from other vendors. If you have technical questions, we recommend asking on the usenet newsgroup news:comp.msdos.programmer Terms on this page are trademarks of Microsoft Corporation and possibly some others. Microsoft's licensing spokesperson "Rich H." told me, on 2-8-00, that anyone with a valid license to use any recent version of Microsoft's operating systems (Windows 95/98, NT) is also licensed to use any older version of Microsoft DOS products, and can obtain DOS 6.22 media for nominal cost from their supplemental materials unit. I haven't heard this before, so you should confirm this for yourself. Thanks to contributors Winston Tom and others. I don't have definitive information on identification, but will provide details on packages I have examined. First package: Binder 6024001 (same as DOS 1.1 binder). No slip case. Title page reverse indicates "First Edition ( August 1981 ), © 1981. License agreement is on the inside front and back cover of manual and back of outer cover. Second package: Outer cover marked 6025146. Binder 6024001. Manual 6172220. 5.25" diskette 6172212. Copyright 1981. First edition revised January 1982. License agreement is on the inside front and back cover of manual and back of outer cover. 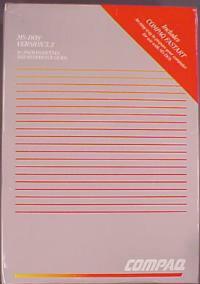 Introduced in May 1982 under IBM's label. Adds support for double-sided floppy disks. Uses same binder as DOS 1.0, but has a round "1.1" sticker on the binder spine. License agreement is on the inside front and back cover of manual and back of outer cover. Front of front cover page and back of rear cover page has number 6172220. Quick Reference card is 6936666. First released MS product. 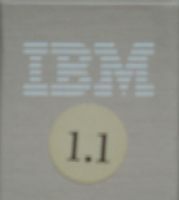 Same feature set as the IBM 1.1 labeled product. Zenith Z-100 package. DOS 2.0 introduced in 1983 along with IBM XT. Rewrite. Support for 10MB hard drives, subdirectories and 360K diskettes. 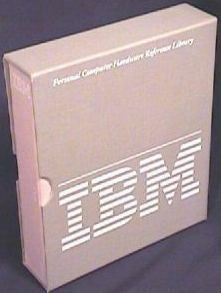 IBM DOS 2.0 package: Slip case marked 6081421. Binder 6024061. Manual 6936752. 5.25" diskette 6936751. 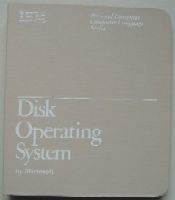 DOS Supplemental Programs diskette 6936786. Copyright 1983, first edition January 1983. Introduced in March 1984. Supports PC Jr. Introduced in 1984. Supports non-English languages and alternate date formats. Introduced in 1984. Adds support for 1.2MB diskettes and disk sizes over 10MB. Introduced in November 1984. Adds MS networks support. Introduced in January 1986. Adds support for 720K disks. Zenith made a 3.21 version. DOS 3.3 introduced in 1987. Adds support for 1.44MB diskettes and multiple 32MB disk partitions. Manual rear labeled 0687 Part No. 036-214-167. Introduced by Compaq in November 1987. Supports drives larger than 32MB. Introduced in 1988. Adds shell menu interface and disk partitions over 32MB and graphical/mouse interface. 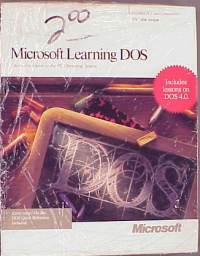 Microsoft Learning DOS 2.0. 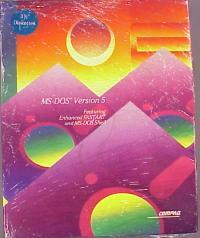 Includes lessons on DOS 4.0. MS product number for 5.25" version is 089-014V200, with box rear labeled 1089 Part No. 07828. MS product number for 3.5" version is 089-015V200, with box rear labeled 0988 Part No. 04333. 036-214V401 - retail box with 5.25" disks, but marked "Not for retail sale except with a computer system." 036-214AV401 - retail box with 5.25" disks, but marked "Not for retail sale except with a computer system." 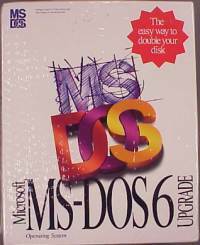 DOS 5.0 introduced in June 1991. Adds full screen editor, undelete, unformat, and task swapping. Replaces GW-Basic with QBasic. MS Part Number for 5.25" MS package: 086-13V50, marked "Not for retail sale except with a computer system" in small print. This and all later versions are termed "Y2K compliant with minor issues" by Microsoft. Microsoft has not tested any previous version of DOS. 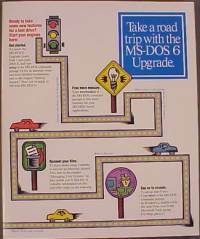 DOS 6.0 upgrade introduced in March 1993. Includes DoubleSpace disk compression. A 3-Pack version of this was also sold for use on three PCs. The 3-Pack product number is 1471699V600. 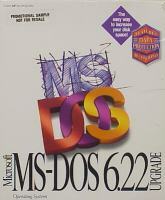 System requirements: MS-DOS 2.11 or later, OS/2, or an operating system compatible with MS-DOS 2.11 or later. Personal computer with 8088 or higher processor. 512K of RAM. Introduced in November 1993. A "Step-Up" from DOS 6.0 has MS part number 147-095-275. A special edition bundled with "Dummies" book. Introduced in February 1994. Removed DoubleSpace under court order. The MS part number for the 6.21 upgrade is 147-095V621. 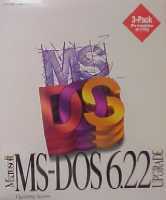 DOS 6.22 introduced in June 1994. "DriveSpace" disk compression. 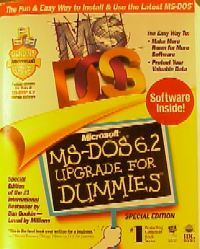 A later package with bundled "MS-DOS for Dummies" book is part number 147-895V622. 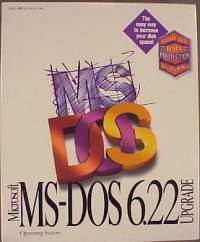 You must be running MS-DOS 2.11 or compatible and later to install it. Only available as part of Windows95 and later Oses. http://winpatch.wgz.org/dos.shtml patches for modern versions of MS-DOS.